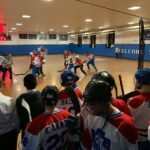 On Motzei Shabbos, December 1st, the MTA Varsity Hockey Lions took on the HAFTR Hawks in the Den. The game started with the drop and tension filled the room as the ball flew back and forth, with a score of 0-0 at the end of the first period. In the second period, Yosef Sullivan (‘20) passed to Aaron Borgen (‘20) and the ball was shot at the goal, it was going and looked good, but the Ref saw otherwise. The second period ended still tied at 0. In the locker room, MTA Coach Rabbi Yoni Stone got the team going with words of encouragement. The third period started and again, there was a lot of tension. Daniel Landa (‘19) came charging down the court, shot the ball, and scored, but it was called off sides. A few minutes later, players aggressively chased the ball, as both teams really wanted to score. With a pass from Yaron Kahan (‘19), Daniel Landa shot and scored. The bench went crazy, as the score turned from 0-0 to 1-0. The game ended with a win for MTA. Shoutout to Goalie Avraham Levi (‘20) for shutting out the HAFTR Hawks.